Mononucleosis, also called “Mono,” is a common illness that can leave you feeling tired and weak for weeks or months. Epstein-Barr Virus, commonly referred to as EBV, is a member of the Herpes Virus family. The virus occurs worldwide, and most people become infected with EBV sometime during their lives. EBV infection occurs during late adolescence or early adulthood, there is a 35% to 50% chance of developing mono. Many children are infected with EBV; these infections usually cause no symptoms or are indistinguishable from the other mild, brief illnesses of childhood. The symptoms arrive 4 to 8 weeks after infection. EBV also establishes a lifelong dormant infection in some cells of the body’s immune system. Symptoms such as swollen glands in the neck, sore tonsils, exhaustion, and extended lack of energy are recognizable as indicators of Mono or EBV. The doctor may order blood tests, particularly the mono spot test. This test detects antibodies to the Epstein-Barr virus, but sometimes it is inaccurate during the first week of infection. A complete blood count may be done to see if the number of lymphocytes is higher than normal, which may support the diagnosis. Antibody titer may tell the difference between a current and previous infection. 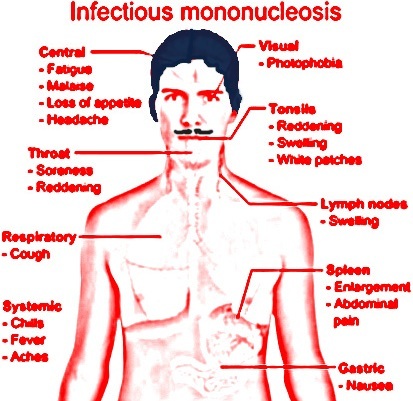 There are no effective medications available to treat Mononucleosis or Mono. Antibiotics and antiviral drugs are not effective against the virus. · To relieve the sore throat, patients should drink water, non-citrus fruit juices, and eat bland foods. · Acetaminophen is helpful along with high fluid intake. · Gargling with warm water and salt or with mouthwash may also relieve pain. · Antibiotics taken with mononucleosis can result in a severe skin rash and swelling, and should be taken if prescribed by a physician. How long would it take to heel? Symptoms will ease within 10 days, but do not expect to return to your normal activities for 2 to 3 weeks.